WASHINGTON, DC - JUNE 25: An employee of Architect of the Capitol uses a leaf blower to clean up the sidewalk in front of the U.S. Supreme Court June 25, 2012 in Washington, DC. 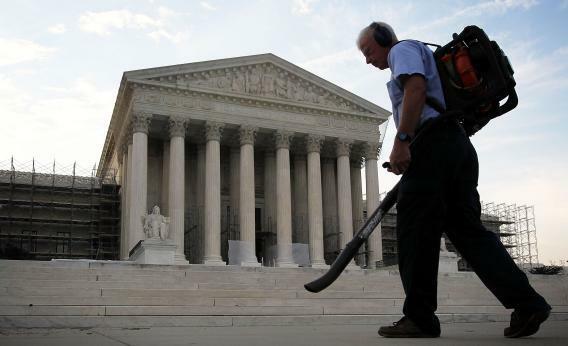 The Supreme Court is expected to hand down its ruling on the Healthcare Reform Law soon. The U.S. Supreme Court, in a major immigration ruling, upheld parts of Arizona’s strict law targeting illegal immigrants, but said the federal government has the ultimate authority to decide who will be held on immigration charges and deported. The decision is a partial victory for Arizona Gov. Jan Brewer as well as for President Obama, whose administration had sued to block the state law from taking effect. The justices said Arizona’s police can stop, question and briefly detain immigrants if officers have reason to believe they are in the country illegally. This was seen as a key part of the state’s law. But the justices said the police have limited authority. They must check with federal immigration agents before deciding to hold the suspects. The justices also blocked parts of Arizona’s SB 1070 that would have made it a state crime for illegal immigrants to fail to carry documents or to seek work. Gary Segura, the Stanford political scientist and co-founder of the polling firm Latino Decisions, told me last week that he thought the Court upholding the law would be a boon to the Obama re-election campaign. Segura told me just now that even though the decision is not quite as clean-cut as the one he outlined, to the extent that the Court has allowed the portion of the law permitting police to stop and detain suspected immigrants to stand, Hispanic enthusiasm and energy for the president could climb even higher. On the other hand, the Obama administration was able to get a tangible victory for immigrants when it comes to seeking work and failing to carry papers, so this seems like the best of both worlds for the White House.